Colorado actually has two Devil’s Punch Bowls, which either signifies a lack of creative naming or a higher-than-normal appreciation for the Spinner of All Lies himself. This one is the easier of the two to access and is located off the west side of Independence Pass, about 9 miles from the town of Aspen (the other is off Schofield Pass near Crested Butte, if you want to complete the satanic punch bowl circuit). Park at the well-signed Grottos Trailhead and hike to the Ice Caves, where the 20 foot cliffs that line the bowl are waiting. 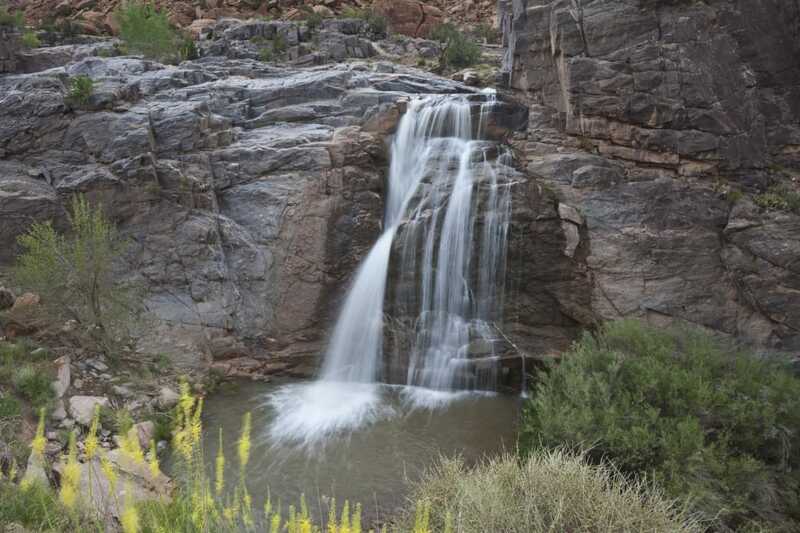 You’ll need some gusto to leap into the frigid waters—though if the Roaring Creek is living up to its name, it may be wise to save your plunge for another day, as there have been accidents here. 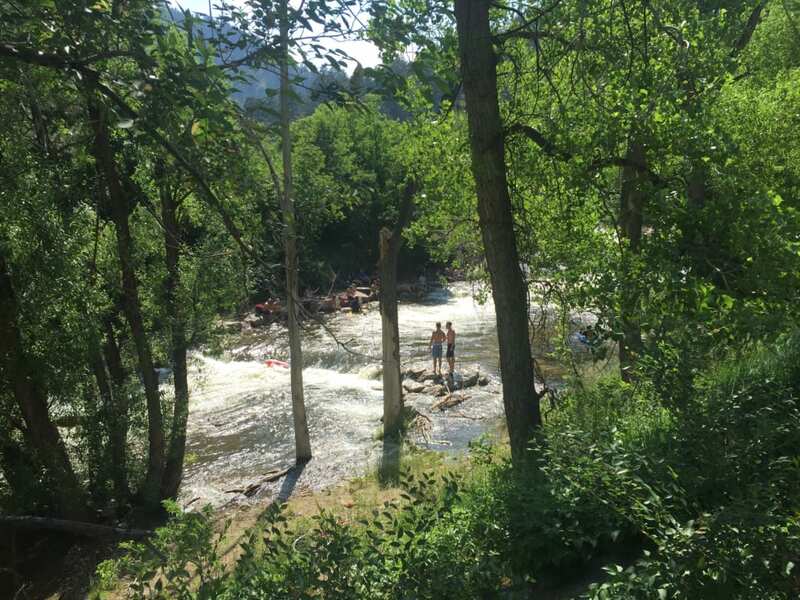 Boulder Creek is a popular place to splash around in the summer, especially once the turbulent spring runoff has calmed down a bit. The best pools are found east of the Settler’s Park area. 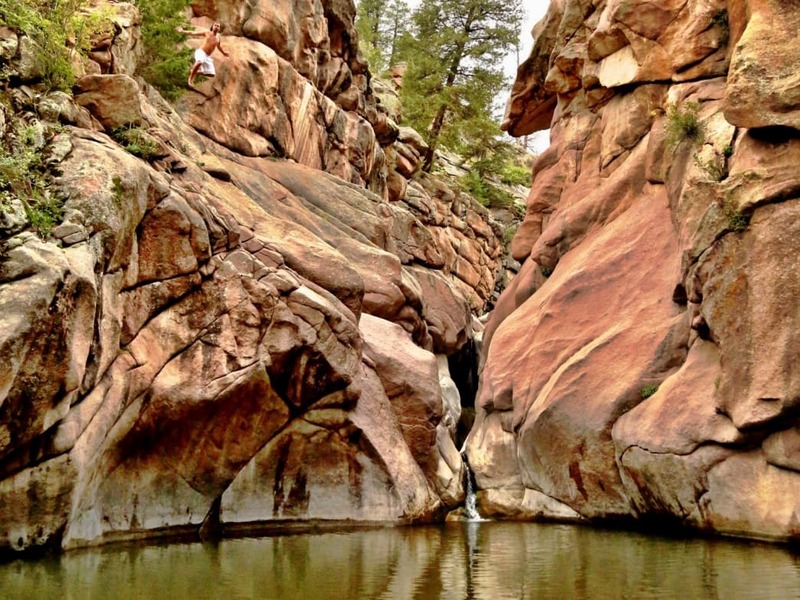 Walk along the Boulder Creek path until you find a good spot to soak your bones. Most months the shallow creek runs swiftly enough to carry tubers and kayakers, though most of the wading pools are spacious enough to have plenty of elbow room. Besides the upper sections of the creek, there are some nice, calm pools for the kiddos just north of the Boulder Public Library along the creek path. Be ready to see some CU Buffs as well, and make sure to bring your own beer pong table. Diving into Paradise Cove, Guffey, Colorado. Paradise Cove is about an hour’s drive from Colorado Springs near the town of Florrisant (you can get detailed directions here ). It’s a humble little area that features a deep pool and some exciting cliffs from which to leap. The natural beauty of the area is quite astounding, considering how sterile much of the land around it is. It can get busy on summer weekends and because it is BLM land, it’s up to the visitors to keep the area clean. Visit on a warm day in mid-September and you may very well have the place to yourself. It’s only a ½ mile hike in, so feel free to tote along your picnic supplies. Big Dominguez Canyon ( directions and details here ) is actually a collection of excellent swimming holes south of Grand Junction connected by the Gunnison River. The waters in the pools are relatively tame and relaxing, making them ideal places to soak. 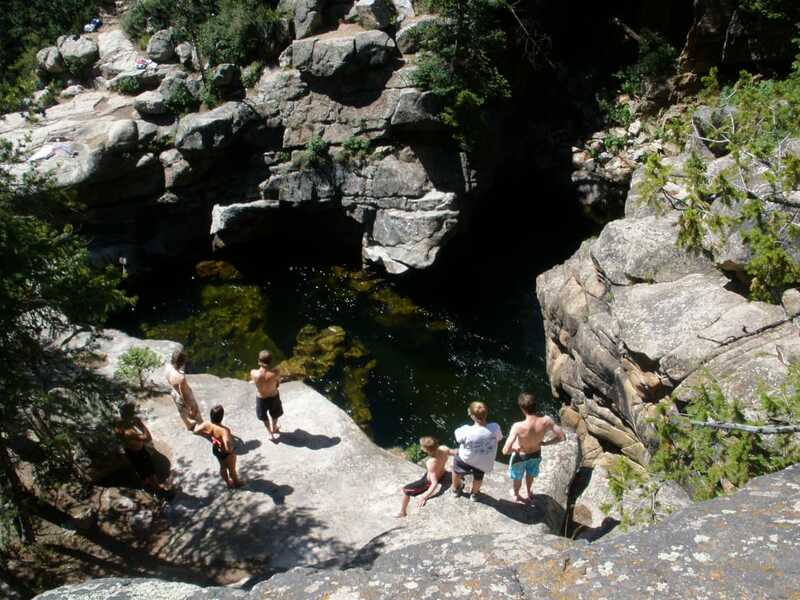 You can even make a tour-du-swimming-holes by hiking to each of the first three primary swimming holes, working up a sweat hiking then cooling down in the water. America’s highest permanent lake, Pacific Tarn. If you are an extreme swimming hole kind-of-a-person, then Pacific Tarn is one alpine lake that will give you some serious bragging rights. This shimmering, green-aqua lake is America’s highest officially named, permanent lake, designated in 2004 by the United States Board on Geographic Names. At 13,420’, you’ll earn your dip by scaling to the south east shoulder of 13,950’ Pacific Peak—and there’s no easy way to get there! The most direct line is via the Mohawk Lakes trails to a class 3 scramble up to the lake itself. Don’t be surprised if you see ice lining the underwater floor of the lake. It’s going to be a quick plunge, but if you are up for the thrill, you’ll earn the chill. Lost Man Lake is another hike-to swimming destination. Start your adventure by parking 1 mile west of the summit of Independence Pass. Head out from the trailhead towards 12,800’ Lost Man Pass on a well-established trail. You may be tempted to pre-empt your swim with a warm-up jump into Independence Lake, which is acceptable, but for the real aquatic deal, continue up and over Lost Man Pass. 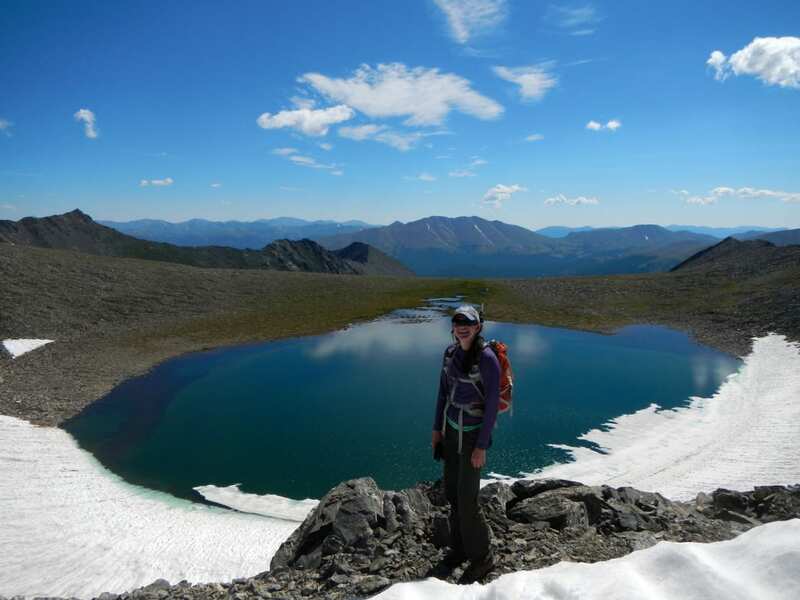 When you reach the top of the saddle, Lost Man Lake will reveal itself below you and it’s quite a glorious site. 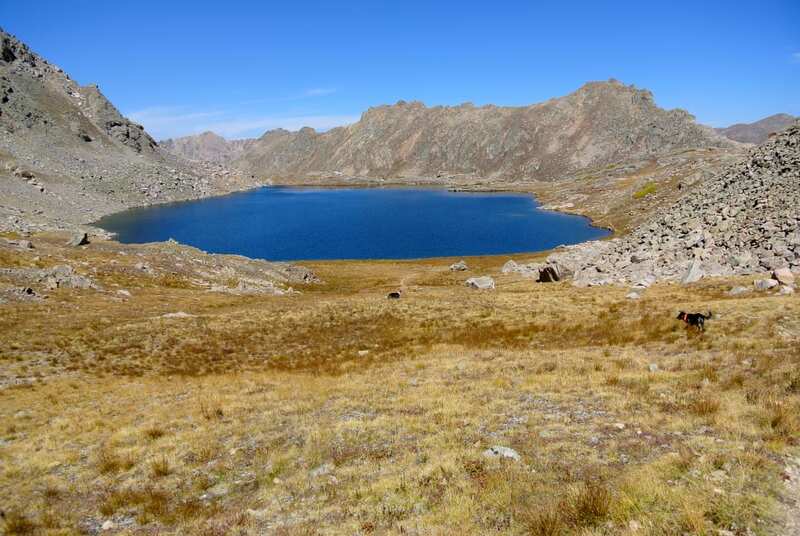 On warm days, this is one lake you can actually swim in, though at 12,450’ it’s gonna be brisk. Mystic Island Lake is a wonderful place to set up camp. Or shall we say, on the shores of Mystic Island Lake is a fine place to camp. This charming alpine lake is accessed by the trails starting at the Fulford Cave Campground near Eagle. 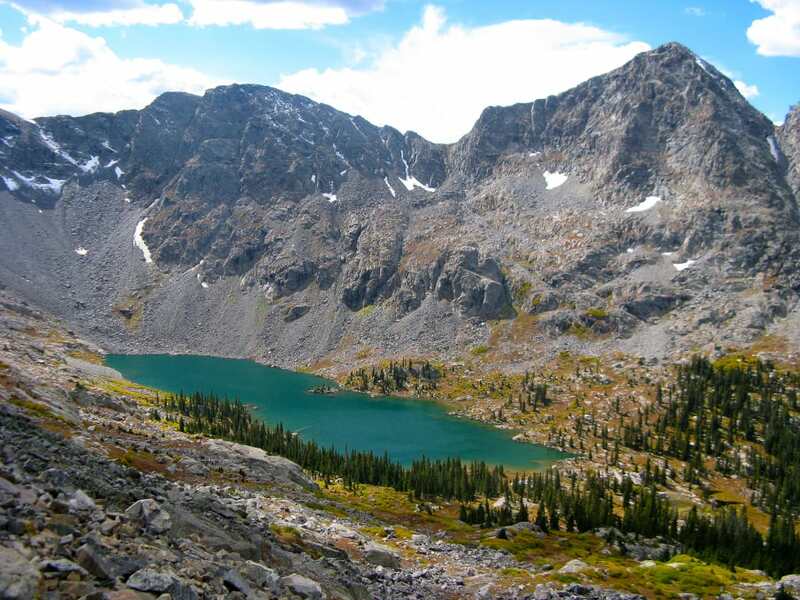 A 4-mile trail first passes Lake Charles, which is mostly surrounded by trees, before reaching the open basin where Mystic Island Lake sits at 11,400’. The namesake island is quite close to shore and in later summer months it’s possible to walk through the thigh-deep, deep-green water for a visit. It’s a fantastic place to purge your filthy, backpacking body before settling for a sparkling clean night under the stars. The Mystic Island Lake looks great!